My kids are working on their Science Fair Projects for school over the Spring break. 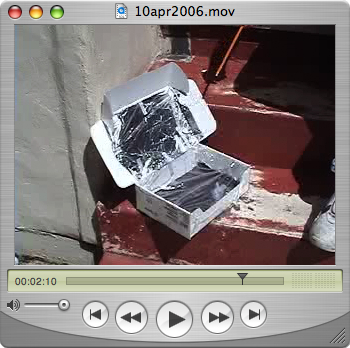 My older son, Ben, explains his early model Solar Oven and how it works. Tests made “in the field” today allowed him to make some modifications. Hopefully we will see the upgraded version soon! Encouraged by Videoblogging Week, I took the weekend off to extend the practice of posting every day. I make a commitment in this video to posting 5 times a week for as many weeks as I can. Let’s see what happens! good job with the oven. be sure to post when he cooks something in it. and good luck with the goal of videos everyday each week. I’ve been attempting it this year as well.